Synopsis: A grandmother uses her wits, faith, and strength to save her grandson from the vengeful, selfish spirit of his mother. 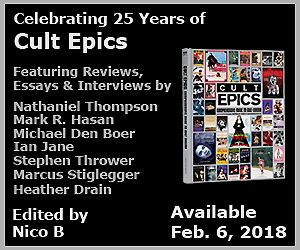 Special Features: Audio commentary with writer-director-composer Dante Tomaselli / Isolated stereo music track featuring bonus 13-track “Witches” album / 1996 “Desecration” short (3:26) / Still Gallery / Trailer / Bonus 2017 featurette “Building the Torture Chamber” (11:47) / Elmsta 3000 Horror Fest in Sweden Promo (2:34). 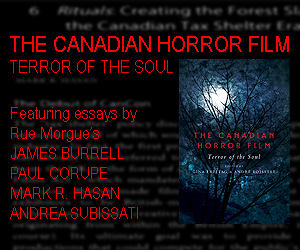 After refining the imagery from specific nightmares into a series of abstract short films (of which a 1996 iteration, also branded Desecration, is included on Code Red’s Blu-ray), Dante Tomaselli fleshed out his surreal tale of a morally corrupt spirit into a feature-length work that’s part nightmare, supernatural shocker, and occasionally wordless experimental film. Christie Sanford reprised her role of the short film’s cruel mother Mary, whereas the more adult Bobby was knocked down to a 16 year old teen, played by Danny Lopes. Like Sanford, Lopes made his feature film debut in Desecration, the first of several films for Tomaselli. Another member of the director’s stock company is Irma St. Paule (Thinner), playing Bobby’s grandmother Matilda, who’s haunted by the mean daughter she’s mentally rewritten as a loving, saintly matron. The story’s elliptical structure mandates surrendering one’s expectations of a formal genre shocker and accepting an intense emphasis on mood and a blurring of realities that are collectively or perhaps separately transmitted by Bobby and / or his grandmother. Bobby’s prolonged daytime nightmare begins with the accidental death of a nun at his religious boarding school. Mary’s influence becomes palpable when he’s distracted in biology class by a demonic nun (also played by Sanford) flanking a hearse, and later quite literally tumbling into a hole that may be a portal to Hell, whereas the events within Matilda’s stream has her drifting into what feels like a dream within a dream wherein she attempts to rescue Bobby from his mother’s simmering grasp. The meshing of viewpoints goes hand-in-hand with invasive, supernatural elements and sightings, some of which are shared among would-be victims or are exclusive to specific characters – a faceless nun, bouts of piercing light, floating shadows – but there’s a culmination in which both grandmother and Bobby are awoken, and their states are linked to a puzzle in the film’s final scene. Catholic iconography, authority figures, discipline, seething guilt and suffering are embedded in many scenes, and there’s only a trio of characters with distant or full detachment from doctrine: Bobby’s loud and ever-complaining father Rullo (Salvatore Paul Piro), a medium (Helen Palladino), and a doctor who carts a viciously murdered nun from the school. All three aren’t physically harmed because Rullo refuted his faith when he witnessed Mary’s blatant acts of child abuse, the medium’s belief system is pagan, and the doctor’s skills & assessments rely on empirical evidence. The rest of the characters are either deeply religious, faithful church minions, or creepy hierarchical figures within the school’s administrative elite; Bobby’s teacher, Brother Nicolas (Vincent Lamberti), always seems to be suppressing a degree of intolerance and unsubtle malevolence. Adding extra fuzziness to the blending perspectives is Mary herself: she appears in an expanded version of the cage scene from the 1996 short as a sultrier mom who torments her trapped son amid walls packed with exaggerated toys; in Matilda’s own recollection of Bobby’s birthday, Mary’s benevolent face suddenly drains to an impatient sadist; and throughout the film she reappears as the demonic, boil-infested nun. There are admittedly more than a handful of ways to read the story, and the inconclusive finale only gels after a second viewing in which a handful of recurring elements are tied to Matilda’s puzzle game, but what interconnects the sequences and tempers the sometimes awkward performances is the striking score which functions as sound design, scene ambiance, and abstract thematic material. Desecration isn’t for all tastes, but it’s an ambitious debut by a filmmaker more concerned in plunging the viewer into a cavernous nightmare, but allowing one to tread into pockets where temperature, light, colour, and reflections are in transitional or transformative states. Tomaselli’s film was initially released by Image in 2000 as a non-anamorphic transfer sourced from the film’s digibeta master edit, and for their 2018 Blu-ray edition, Code Red makes a point in stating the original Super16 film elements no longer exist, hence the decision to upres the master to 1080i – a move which may puzzle HD purists, so I asked the director several questions regarding the original film print, the video master, and crafting the excellent (and still punchy) soundtrack. Mark R. Hasan: Code Red’s upres-ing seems to be 1080i. Was the interlacing retained to avoid the image softening that can result from upres-ing 720 to 1080p? 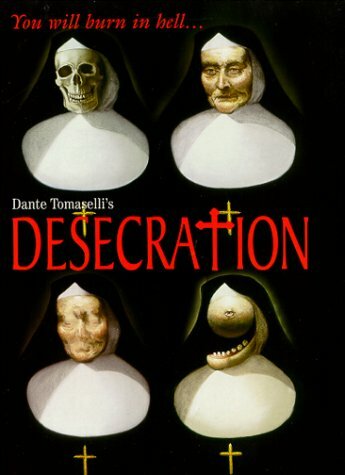 Dante Tomaselli: Desecration was shot on Super 16mm film at 24 fps, then transferred to NTSC videotape for editing. That ghosting you might see from time to time comes from the duplication of frames to extend the 24 frames to 29.97 frames per second, and since Desecration was edited before progressive video was developed, all the frames became interlaced during the transfer as well. I wish I could find the original Super 16mm film print. It premiered at the 1999 Fantafestival in Rome, Italy and then I never saw it again. I searched and searched and the original print is just gone. I need to contact a psychic who specializes in finding the lost… the missing. MRH: With some of your later films, the score & effects stem from a long pre-production period in which you explored ideas & options, and crafted scripts to sometimes meet the demands of the sounds. Did the sounds for Desecration come after the film’s photography, and was there a period of discovery in searching for and refining analogue and digital elements to match what you imagined? DT: For Desecration, I was driven to find the bulk of sounds before actual filming. I remember collecting huge amounts of sample CDs – all kinds of genres and falling in love with very specific hypnotic effects and then organizing them with descriptive titles. I’m really drawn to weather… I like for the atmosphere to dominate. With Desecration, many layers of samples were employed like ocean waves, volcanoes, earthquakes, tornadoes… to convey a kind of emotional violence. It’s possible to paint a tranquil picture with the same palette too. So this was the beginning of my obsession with painting with sounds… My early Desecration shorts and the making of the feature film itself… And all these years later I find that I’m still doing the same thing… I mean with my upcoming feature, The Doll… I already have the soundtrack album released, as you know, before the movie is even filmed. But getting back to Desecration… there were certain eerie sounds that I incorporated from Desecration shorts that I felt would be effective and comfortably fit in the feature. Some did. Some didn’t. I had my eye on creating the feature all the time, no matter how many years it took to get there. I remember in 1998 when I was 28, I finally had the privilege of being on set, shooting the full length feature. I remember listening to different samples on my headphones in between takes and mixing them in my mind… whether or not they matched the finished scene within the context of the whole movie is a different story. After picture editing, I was experimenting with material that unfortunately sometimes didn’t actually match up… On the up side, I had many, many alternates so that I was eventually able to find the right sound temperature for each moment in the film. I might have headaches with other aspects of filmmaking… the shooting of the film is especially tricky and there are sometimes other different opinions swirling but when it comes to building the soundtrack… Well, serotonin is released in my brain and it’s just me, all alone in the studio with my sounds and I have a well known love affair with the post sound production phase. For sure, what matters most is the film footage and finding an aural match that gives the scene clarity and closure. Again, I was often disappointed to discover that many sounds I fell deeply in love with during pre-production and conceptualized for inclusion in the film didn’t necessarily match up to the actual filmed footage. When this was the case, I would hunt and hunt until I found the right combination. I’m a sound hunter. It deeply unsettles me when my music or sound design is out of place. There’s a visceral reaction… I feel emotional pain myself… until it’s fixed. MRH: What were some of the electronic instruments and processors used to shape the score, as the final mix features very crisp, clean components that remain quite fresh? DT: I think the reason why there’s an overall crispness to Desecration‘s soundtrack is because I purposely chose to incorporate crisp aural elements. I have sound-color synesthesia and I’m naturally drawn to glacial, pristine sounds… The kind of crisp sounds that glow for me, I spotlight. And I like to mix and layer the iciness with a deep heavy throbbing baritone. It’s that combination… that intersection… It’s just where I lurk, sonically, for some reason. So the overall result has has more to do with that than any equipment utilized since this was a low budget stereo mix in 1998. A lot of the main sound elements for Desecration came straight from the thousands and thousands of sample CDs that I owned the rights to, layered and mixed. As you know, I like to sculpt many layers… or tracks… until a lone sample is completely unrecognizable. More than likely in one of my mixes, there’s usually fifty or sixty layers stacked on top of each other… sometimes more… for a kind of subliminal effect… But I can definitely strip it down too. I just need to start with a lot first. To me, it’s a sound sculpture. I always mix in my head first before anything happens. I do this on my albums as well. 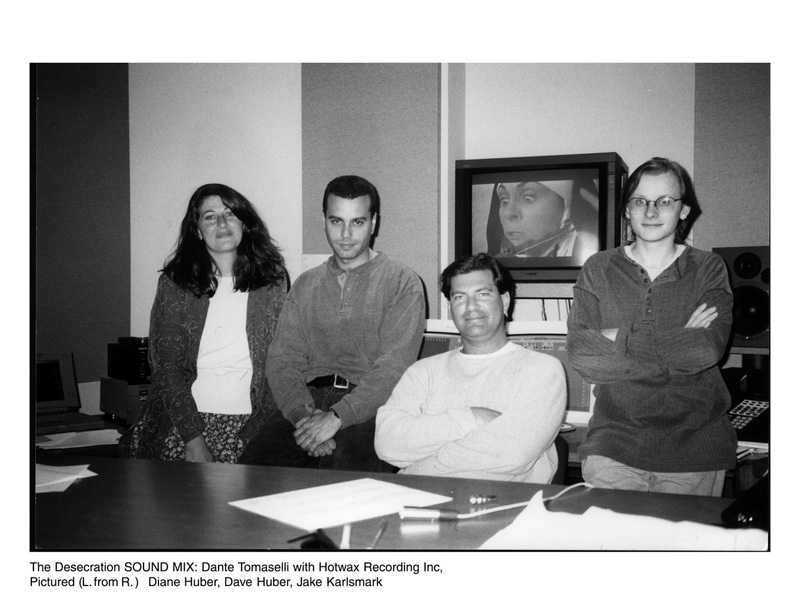 I remember on the Desecration sound mix, the owners of the studio in NYC, Hotwax Recording said that they never worked with a director who used as many tracks in their films for sound design and music. As far as processors, I do remember going very heavy with reverb on Desecration – more so than any of my other films. MRH: What was it like collaborating with your brother Michael and John Califra, and were there any approaches to scoring and / or technical ideas that proved invaluable on later film scores and CD releases? DT: John Califra was a freelance composer and I met him while mixing Desecration at Hotwax Recording in NYC. He was a good friend of the owners of the sound studio at the time and witnessed the project as we were in the middle of mixing. I remember I listened to his reel and wanted him to specifically score one sequence which had an orchestral vibe that I could never deliver on my own. That scene was the nun wedding near the beginning of the film in the church where Sister Madeline’s candle won’t light. John Califra happened to score that beautifully and it’s probably a highlight of the film. I never had a composer score a specific scene for one of my films ever again… even though that worked out very well. I will, if needed though. I guess part of my formula is that I like to have composers not viewing the film footage… working with their own imagination and hopefully delivering something totally unexpected. Then I’ll grab the composer’s material and layer and blend it with my own music until it morphs into something that I personally know the visual is craving for. I enjoyed working with my brother Michael because he really understands me and hopefully I didn’t traumatize him too much growing up when I would lock him in the basement and scare him with horror music (laughs). Seriously, I used to frighten him with Wendy Carlos’ music for The Shining (1980)… That sinister, ethereal opening theme… He would quiver in fear… Sometimes maybe I was a bit like the mean older sibling in Alice, Sweet Alice (1976) [laughs]. Michael’s now a graphic designer and musician and he supplied some soundscapes and textures to some of my other films too, like Torture Chamber. I remember for Desecration he created a DAT tape with about 45 minutes worth of material and I loved it. Best of all were his opening and closing themes which contained a lot of the nightmarish samples I was already using in other parts of the film. Like all my composers on all my films, except John Califra, Michael didn’t actually see the footage he was scoring – I didn’t want him to. To me it’s fresh and unique when the material comes straight from the musician’s own interpretation of a scene. I’ll ask a composer to conjure different moods that I require… and if it doesn’t match up with the picture then I’m left with misfit sounds that just generally get put aside into a bin. But I know that sometimes it all just coalesces. Like the cage scene in Desecration, which is kind of the centerpiece of the film… I had so many tracks going on at once it was just insanity… I mixed and scored that sequence in a trance… I remember the 1998 Pro-Tools sound system constantly crashing because it was so overloaded… I had layer upon layer of synth tones, coughs, sneezes, earthquakes, pigs grunting, cobras hissing… I could go on. Next I incorporated a weird lullaby from Michael, his voice modulated. I remember I then spliced it all together…this concoction…this madness, this aural mayhem…and isolated different sections… playing them in reverse. Sometimes it sounded flat and terrible and sometimes it really worked! Through experimentation and trial and error, I was going for a kind of satanic out-of-body experience…a tactile, 3-D-like ride. Finally, when every sound interlocked and truly aligned, I could feel the emotional violence on screen. The effect was pretty hallucinatory, like being trapped in a dark and colorful dungeon. Since all my films are told through a series of dreams, flashbacks and hallucinations, I usually aim to create soundscapes that are otherworldly… almost celestial. I want the audience to taste color and touch sound. I’m trying to construct a nightmare in which we experience the protagonist’s damnation. In spite of the technical limitations of the digibeta master – combing during some lateral movement, the odd hot white levels, and slight green chroma misalignment redolent of S-VHS (St. Paule’s wrinkles are especially affected in the medium scene) – this is an elegantly shot production with pensive camera movements and precise compositions for the film’s showpiece nightmares. Tomaselli’s use of wide lenses pays off especially in the cage scene where the giant toys and letter blocks curve down towards restricted Bobby; and a lengthy wandering montage involving a massive present, a forest escape, and the inclusion of a model castle. Sonically, the stereo mix (erroneously stated as mono on the disc sleeve) is excellent, showcasing the panned effects and clarity of the synths used by the score creators. Particularly potent is the oft-cited cage scene, which has eerily processed vocals that curl and lick in a strange organic fusion. In the commentary track, the director provides a good overview of the film’s genesis and production, striking locations, casting choices (including his mother as the school’s Mother Superior), various themes, and whole scenes which stem from his personal nightmares. The commentary does thin out towards the end, but most of salient details are addressed and contextualized. In addition to a short still gallery and trailer, there’s a making-of featurette ported over from Tomaselli’s recent film Torture Chamber, and a recorded address to audiences attending Sweden’s Elmsta 3000 Horror Fest. Tomaselli’s other films include Horror (2003), Satan’s Playground (2006), and Torture Chamber (2013). Additional interviews from 2015 and 2007 in which the director touches upon his themes, nightmares, and creative process in crafting a sonic draft before filming are also available at KQEK.com.